The Japan Electric Power Development Corp (J-Power) will resume construction of the Ohma nuclear power plant in Aomori prefecture. It will be the first Japanese nuclear construction project to restart since all such projects were suspended following the Fukushima accident. Work to build the 1383 MWe (gross) Advanced Boiling Water Reactor (ABWR) in Aomori prefecture was 40% complete in March 2011 when a tsunami caused the accident at Tokyo Electric Power Co's (Tepco's) Fukushima Daiichi plant. An extended hiatus followed, during which Japan developed a new energy strategy. J-Power said today that "the treatment of nuclear power plants under construction became clear" thanks to the revised energy policy announced by the Japanese government. Accordingly the company decided to resume construction of the Ohma plant, "with the understanding of the local communities." The company said that it will strive to establish a safe power plant by, among other things, ensuring that reinforced safety measures are implemented that take into account the lessons learned from the Fukushima accident. J-Power will also ensure that all current and future technology standards set by the new Nuclear Regulatory Authority are met. 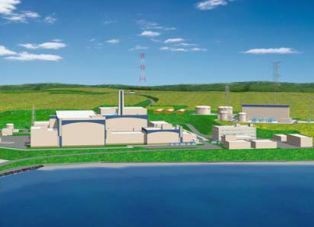 "As a power plant that adopts the most advanced technologies, the Ohma nuclear power plant will be a highly safe and reliable power plant that will play an instrumental role in the stable supply of electricity and the nuclear fuel cycle of Japan," J-Power said. The company has taken various measures for reinforcing safety at the Ohma plant, including a range of anti-tsunami actions, ensuring emergency power sources and ultimate heat removal functions, and improving response to severe accidents. Ohma would be the first Japanese reactor built to run solely on MOX fuel incorporating recycled plutonium. It will be able to consume a quarter of all domestically-produced MOX fuel and hence make a major contribution to Japan's "pluthermal" policy of recycling plutonium recovered from used fuel. This policy increases Japan's self-sufficiency in energy fuels from 4% to 18% by making maximum use of imported uranium. The start of construction of the Ohma plant was originally due in August 2007, with commercial operation planned for March 2012. However, the imposition of more stringent seismic regulations put back the start of construction May 2008 and commercial operation to November 2014. J-Power said that it has not yet scheduled a new date for the start of operation "but intends to review the matter in the future based on progress in construction." In addition to the Ohma plant, construction was also suspended of unit 3 of Chugoku Electric Power Co's Shimane plant, while the start of construction of unit 1 of Tepco's Higashidori plant has been deferred from the original April 2011 date.